Italy’s Amalfi Coast, a string of ancient towns perched on a peninsula above the Tyrrhenian Sea, is famous for its intensely perfumed, sfusato lemons. Lemon trees on terraces stairstep up the steep mountainsides, sharing space with olives, grapes, oranges, figs, and vegetables. 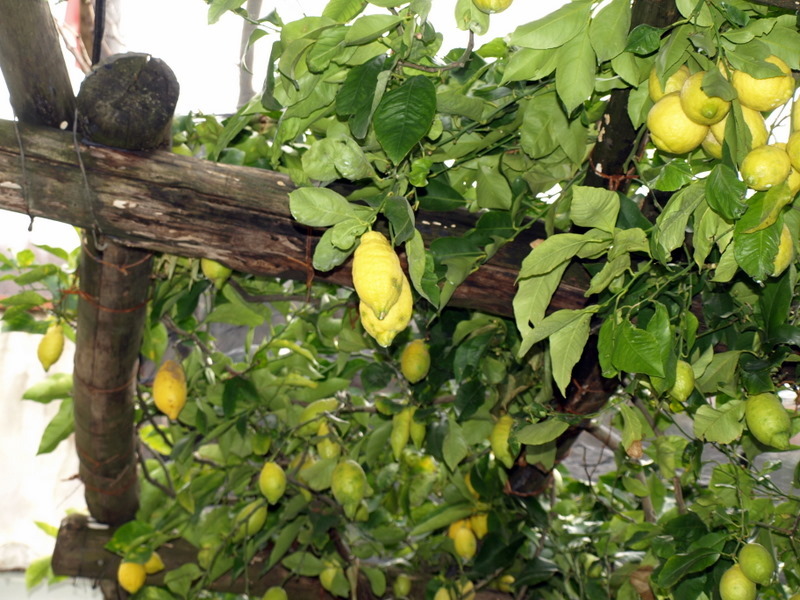 Wooden arbors support the heavily laden trees, draped with netting to prevent fruit damage. Walking under the trellised groves, inhaling the mixed scents of sea air and fragrant fruit, must rank as one of the world’s great olfactory treats. The steep terrain means that the fruit is hand-picked and carried downhill to market; the occasional sure-footed mule is still seen hauling heavy loads up and down the terrace steps. 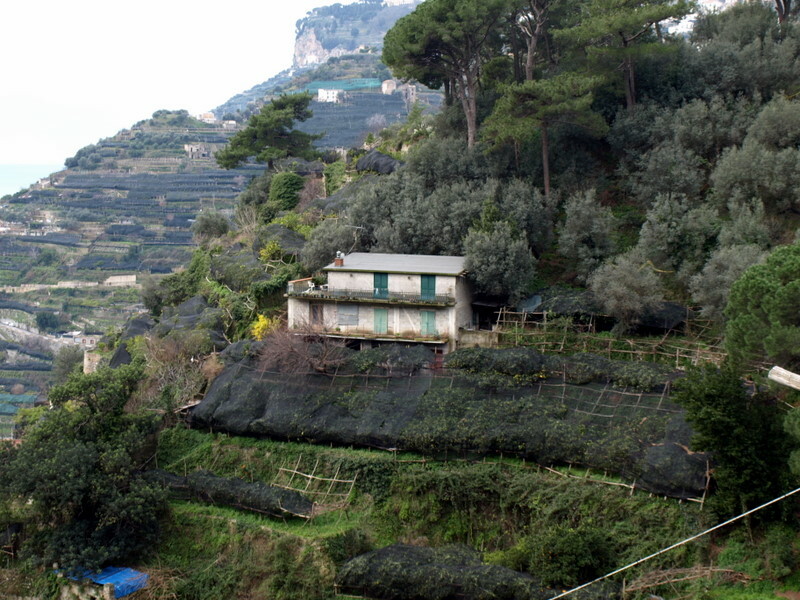 Commercial lemon cultivation here is ancient, dating to at least the 11th century, when the Republic of Amalfi, allied with Arab traders, dominated regional seafaring. The sfusato’s exceptionally high vitamin C content helped the ships’ crews prevent scurvy, the bane of long sea voyages. The sfusato variety at maturity is also quite large, with a deeply pitted, bumpy skin rich in essential oils. 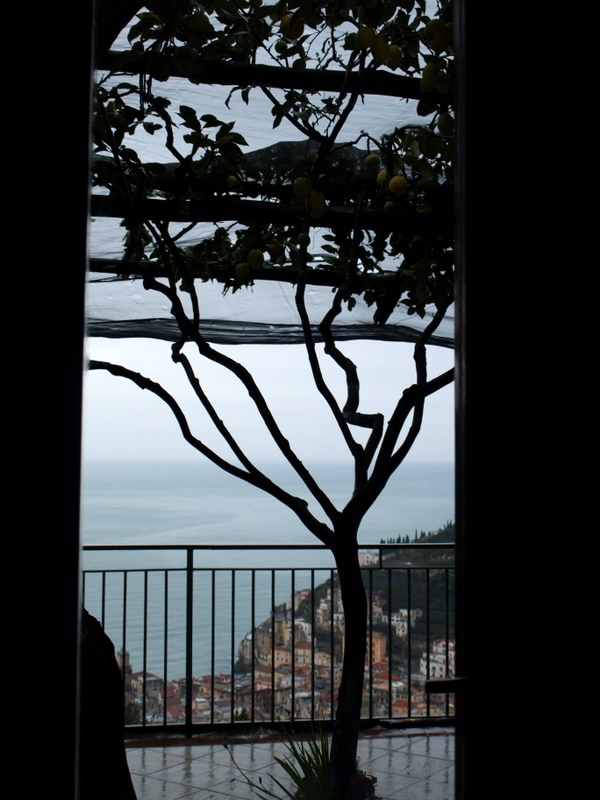 Though the Amalfi Republic fell more than 1,000 years ago, the lemon culture survives–today, most of the crop goes into limoncello liqueur, jams, and locally produced & consumed lemon pastries. While the weather on the Amalfi Coast in February was cool and rather wet, the yellow lemons brightened every view and nearly every dish. 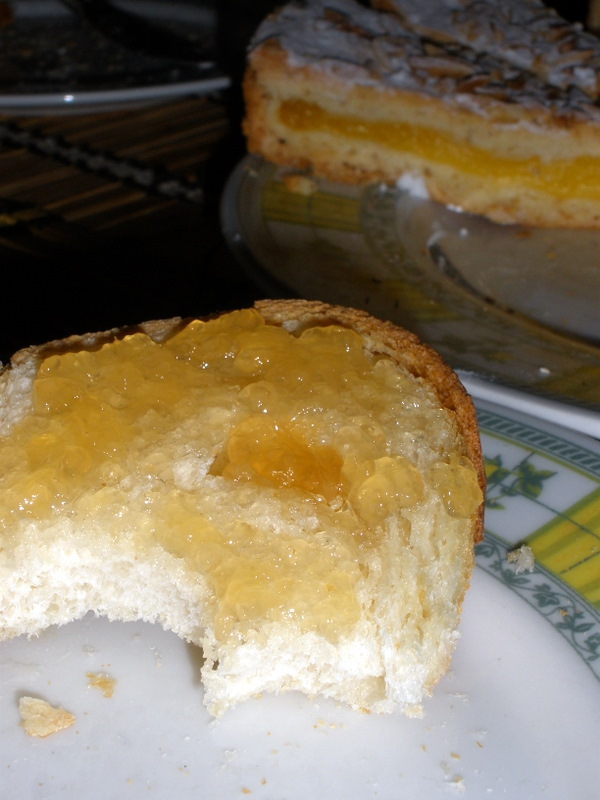 I managed to get home with a big jar of lemon jam–the scent alone is a powerful reminder of a beautiful corner of Italy. Spread on homemade sourdough bread, it was an edible postcard. I’ll have to get some ricotta to go with tomorrow’s lemon jam & toast…. It certainly was steep…in fact, the proprietors told us that they raise a smaller, leaner breed of pig native to the area; larger-maturing, heavy hogs are too big to handle at butchering time. The dead hog has to go up and down those steep steps, just like everything else. I look at these photos and read these words and my heart just squeeeezes with longing to be there. Looks like you had a beautiful trip. Wait ’til you see tomorrow’s food photos—it will be your stomach doin’ the squeezin’. It is a lovely part of the world, even in a cold February drizzle. We were in Positano in 2008. The most beautiful place I’ve ever seen. And the steepest! We also brought back some of the terrific limoncello.